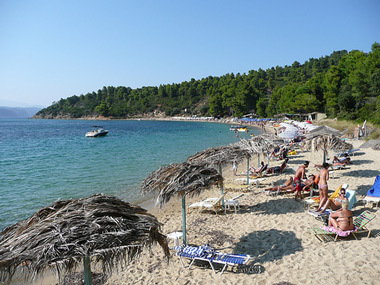 Skiathos is famed for its 62 beaches. Some are sophisticate and organized some quiet and solitary but nearly all are extraordinary. Organized beaches are on the south side, where most people go, but on the north side they are untouched except for a couple ones and wonderful for bathing when it isn't too. 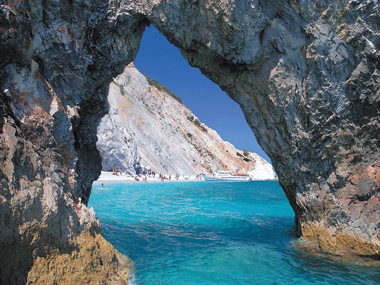 One of the loveliest in Greece, with smooth boulders, striking rock formations like the enourmous Petra with its centre arch and blue-gree waters. Access is by boat only, from the harbour or in your own. There is nothing ther so take your food and water. 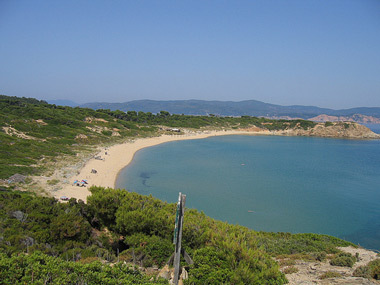 Exotic beach with sand and unpolluted waters north of Koukounaries. You can get quite close by car and then walk for 15 min. A canteen and a few umbrellas. 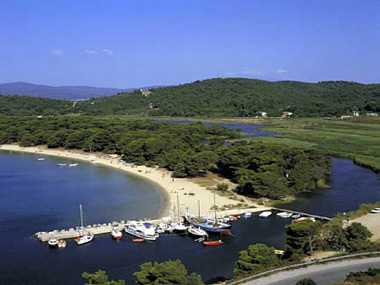 Two peaceful and attractive beaches, one small and one large, surrounded by forested hills. There are tavernas in the area. The smaller in the prettier, with an impressive rock, grass and wooden tables under the olive trees. Appropriately named "paradise" locally. 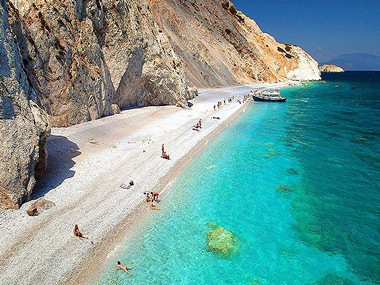 One of Greece's best and best known beaches, 1 km long. A protected ecosystem and a uniquely beautiful combination of thick - growing. Aleppo pines, the lagoon of Strofylia connected to the sea by a channel golen sands and translucent sea. 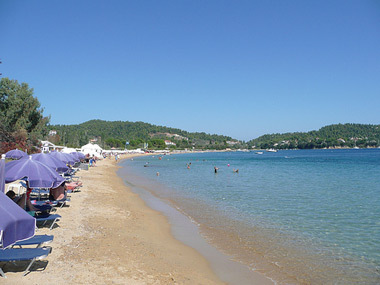 It attracts crowds, especially in August and is organized with water sports, umbrellas and snack bar. 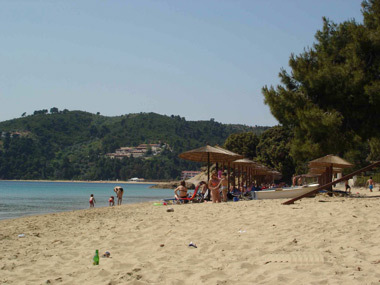 The smaller is the nudists' beach organized with umbrellas and a canteen a fine beach and greenery, the bigger is also organized and sandy with clear waters and two tavernas and water sports. 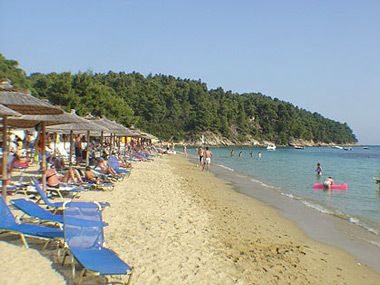 Organized snd beach with a canteen and two tavernas. Turquoise seas against a lush green background. 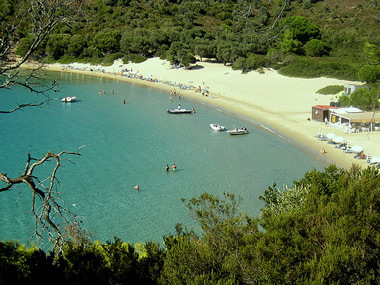 You'll find small solitary coves between Koukounaries and Troulos with trees for shade. Lovely surroundings ideal for romantics and courting couples. Reached in 20 min by the boat which leaves port every morning. Delightful scenery and shallow water. 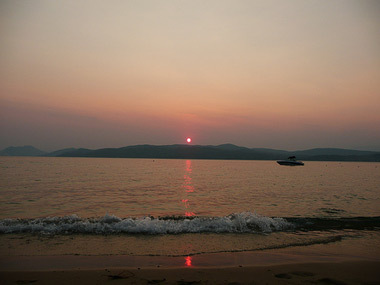 The northern beach is unspoilt and lovely but difficult to et to because or reefs. 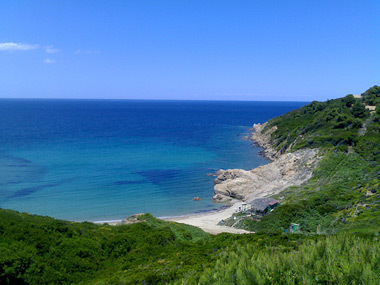 There is an organized beach on the west side in a green and charming spot with wonderfully fine sand and clear azure sea. Umbrellas and a canteen which also has fresh fish caught by the owner. Do not fail o see the chapel of Agios Floros with its unusual architecture, and the old house with the abandoned Konialides olive press containing the rusty remains of its machinery. A little islet with sand to the top of the hill. 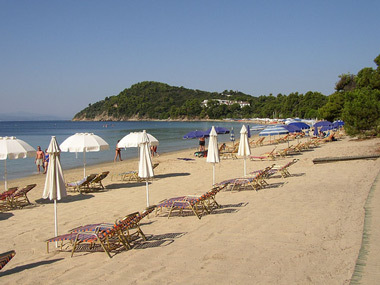 No crowds clean and with an excellent taverna in the shade of its pergolas.